“While I have only been an employee at Quality Center for Rehabilitation & Healing for two months, I have already decided that it is one of the most rewarding jobs that I have ever had. I find that my co-workers understand the meaning of teamwork, and anytime I have a question or need assistance, they jump right in without hesitation. Most of all, I love the interaction with the residents. Their smiles bring a smile to my face and brighten my day tremendously. To sum it up…I love working here!” – Sandra R.
“I was admitted to Quality Center for rehab after my back surgery. I was nervous at first and worried about the pain, but I will say, I have been taken care of greatly! I really like the physical therapy staff, especially Randy and Chandelle! I am improving everyday and look forward to making a full recovery! Everyone here is very friendly and patient with me. I really enjoy it here.” – Steven S.
“I enjoyed my stay here and I liked all of the people, but I am ready to go home! I feel so much better that I may go try to find me a place to go square dancing, especially now that my ol’ leg is better!” – George C.
“I like working here because I enjoy seeing the residents every day; they are my family! Sometimes people don’t understand why I haven’t gone back to school to become an RN or LPN and I tell them that I feel like this way I can spend more time getting to know may patients and also I enjoy building friendships with them. I really like what I do!” – Sherry P.
“Please share this with every staff member: You all have been such a blessing to us! Thank you for taking such good care of my husband, Jimmy. He was very sick and you all nursed him back to health; it is very much appreciated! Thank you and God bless!” – Rena S.
“My stay has been very nice. My nurses and techs have all treated me well. The food has been wonderful, and you can expect meals at the same time every day.” – Linda M.
“The people here take good care of me. I have been in three wars during my lifetime, and I have seen a lot. I got to the point where I couldn’t take care of myself any longer. So I moved into Quality Center for long term care so I could relax and enjoy the rest of my years at a place where I knew I would be taken great care of.” – Billy C.
“I have had better physical therapy here than anywhere else! 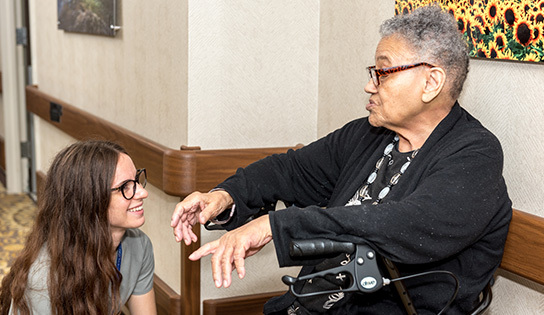 Both my occupational and physical therapists helped me to regain strength which has allowed me to go back home.” – Joyce N.
“I’ve had a great experience at Quality Center recovering from surgery. Anytime I needed anything, someone was there to take care of me. There was always someone around the corner ready to assist.” – Jeffery H.
“I enjoy working here at Quality because I love the residents. They are all so friendly and a joy to be around.” – Justin F.
“Thank you for taking the time out to ensure things are okay here for me. I really appreciate what you’re doing!” – Billy C.